Time to Replace Your Rinker Boat Canvas? Rinker Boats has always been dedicated to giving you more than you expect. They’ve built their boats under the Midwestern values of hard work, attention to detail, and a dedication to craftsmanship. For many years now, Rinker has chosen to have Ameritex manufacture the canvas tops and covers for their boats because we share those same values. 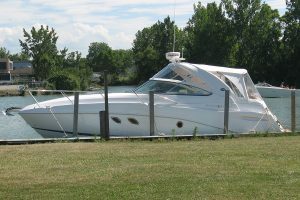 Bimini tops, bow and cockpit covers, mooring covers, the list goes on and on. If those items have worn out on your boat, due to years of exposure to the elements, then nothing will protect your Rinker like replacing those battered parts with exact-fitting, identical, replacement canvas parts from Ameritex. If you can find your Rinker model listed on our easy, no-obligation quote form, then we are the company that made the original canvas for Rinker, and we can make it for you again now. A Rinker boat comes with the confidence that you are receiving value not found anywhere else in the industry. You care for your Rinker. Protect the value of your investment. Generic, off-the-shelf boat canvas simply won’t do. A model-specific, replacement canvas boat top or cover from Ameritex is the only thing that will carry the same promise of attention to detail and craftsmanship that made you buy your Rinker in the first place.